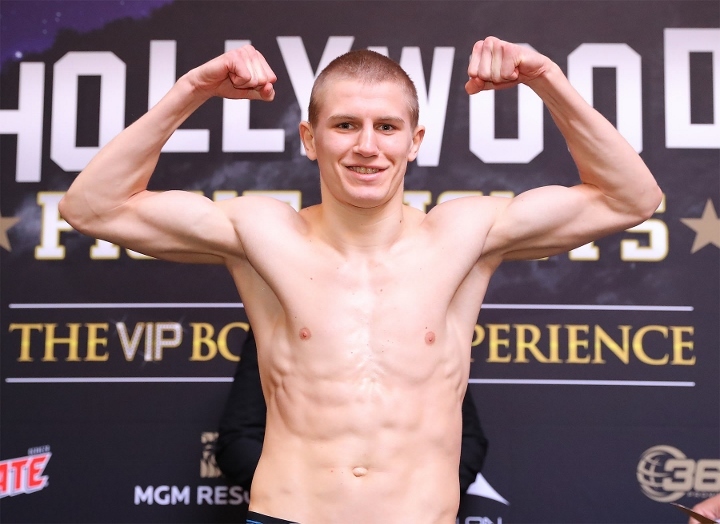 HOLLYWOOD - Even when the opposition keeps getting more difficult, junior middleweight prospect Serhii Bohachuk is hardly breaking a sweat. Bohachuk battered Cleats Pendarvis for the three rounds earning another knockout victory Sunday night and improving his record to 13-0, 13 knockouts. The 23-year-old Bohachuk was making his 2019 debut after accumulating six knockout victories last year. The southpaw Pendarvis was fighting for the first time since July of 2017, when he had fought four times that year, winning all those bouts against mediocre opposition. Bohachuk, who is trained by Abel Sanchez, made his presence be known early in the fight, dropping Pendarvis to one knee with a left hook to the body. Pendarvis, who was a former fringe junior welterweight contender and weighed 160 pounds at Saturday’s weigh-in, got up and fought cautiously the rest of the round as Bohachuk closed the distance. Pendarvis continued to back away as Bohachuk walked him down during the second round. Towards the end of the third round, Bohachuk got close enough to land a left hook to the head, dropping Pendarvis to the canvas. Pendarvis beat the count and returned to his corner at the end of the round. At the start of the fourth round, Pendarvis remained on his stool, prompting referee Jack Reiss to wave the fight off at seven seconds. The 32-year-old Pendarvis, who resides in Los Angeles, drops to 21-5-2, 9 KOs. In the co-feature, Ali Akhmedov defeated Mike Guy by unanimous decision over eight rounds. The unbeaten Akhmedov, who is also trained by Abel Sanchez, is now campaigning as a super middleweight after having fought most of his career as a light heavyweight. Guy had not fought since July of 2017, when he lost a close decision to unbeaten Junior Younan. Akhmedov, who is originally from Kazakhstan, took a couple of rounds to get going and find a rhythm as Guy’s head movement and savviness prevented him from landing anything of substance during the first two rounds. Akhmedov finally closed the distance in round four, landing a right hand to the head that momentarily stunned Guy towards the end of the round. Guy’s punch output dropped during the second half of the fight, as Akhmedov’s aggression and punch output increased. Akhmedov battered Guy during the final two rounds of the fight, but was not able to hurt or drop his opponent. Scores were 78-74, 79-73, and 80-72 for Akhmedov, who improves to 14-0, 10 KOs. Guy, who resides in Sacramento, drops to 9-4-1, 5 KOs. Middleweight prospect Meiirim Nursultanov remained unbeaten, defeating gatekeeper Luis Hernandez by unanimous decision over eight rounds. Both fighters exchanged punches in the pocket during the first half of the fight, with Hernandez utilizing his savviness to counter Nursultanov. It was all Nursultanov from the fifth round on. The Kazakh fighter, who now resides in Oxnard and is managed by Egis Klimas, connected with several combinations to the head as Hernandez’s punch output dropped in each round. Hernandez (16-8, 9 KOs) was deducted a point from referee Wayne Hedgpeth for holding and hitting after being warned several times to stop earlier in the fight. All three judges scored the bout 79-72 in favor of Nursultanov, who improves to 11-0, 8 KOs. In an all-action fight, lightweight Mario Ramos won a hard-fought unanimous decision over Arnulfo Becerra. Both fighters stood and traded in the pocket. The southpaw Ramos landed the more-effective punches during the first two rounds, but Becerra connected with several right hands in round three. The best round of the fight was round four, as both fighters landed traded vicious hooks and crosses to the head, opening cuts along the bridge of the nose of Becerra and over Ramos’ left eye. Becerra walked Ramos down during the final two rounds, but Ramos effectively countered to Becerra’s head. Scores were 59-55, 59-55, and 58-56 for the 19-year-old Ramos. In welterweight action, Devon Lee (7-0, 6 KOs) was taken the distance for the first time as a pro, defeating Daniel Perales (10-16-2, 5 KOs) by decision over five rounds. All three judges scored the bout 50-45 in favor of Lee. Junior lightweight Adrian Corona defeated veteran Guadalupe Arroyo (3-16) by unanimous decision. All three judges scored the bout 40-36 in favor of Corona, who goes to 4-0. Corona is the son of California referee Ray Corona. Flyweight Christian Robles (3-0, 1 KO) overcame a knockdown in round two to defeat Jesus Godinez (2-3, 1 KO) by unanimous decision. All three judges scored the bout 38-37 in favor of Robles. Bantamweight George Navarro won a hard-fought majority decision over Joseph Cuellar, who was making his pro debut. One judge scored the bout 38-38, while the other two judges scored the bout 39-37 in favor of Navarro, who goes to 5-0-1, 2 KOs. In junior featherweight action, Timothy Ortiz was successful in his pro debut, dropping Anthony Torres (0-4) once before ending matters at 1:17 of the third round.